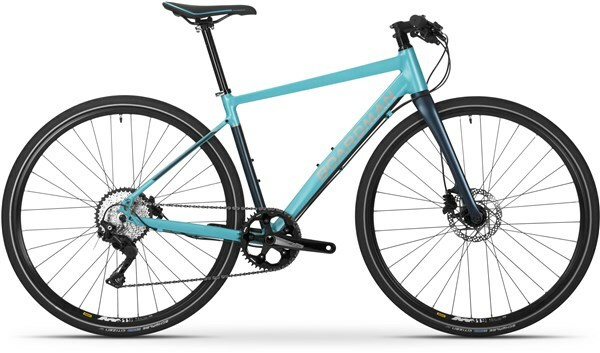 The versatile Boardman HYB 8.8 Mens Hybrid Bike Hybrid Bike gives you the same great style as the Boardman HYB 8.6 but comes in nearly 1 kilogram lighter and has even better components. The main change is the Shimano 1 x10 gears which deliver on the "less is more" principle. Simply put you have fewer gears (but still the same huge range due to the 42 tooth cassette), less weight, less to go wrong or maintain, and happily less chance of choosing the wrong gear. This is not dumbing down the ride - on the contrary, it's being clever and is a facet that keen mountain bikers started using years ago. Additionally, you get better brakes and a better fork so that control and comfort are even better! What more reason do you need to explore new possibilities? If you fancy a few upgrades, why not trade up to the HYB8.9 for SRAM Apex 1x11 gears, smooth rolling Schwalbe Marathon Racer tyres, Selle Royal gel saddle and SRAM Level brakes. Headset: FSA Orbit C-40 ACB, 1 1/8" - 1.5" tapered, integrated, 15mm top cover + 1x10mm and 3x5mm spacers. Pedals: Wellgo alloy flats, 9/16"